''Bacall'' by Alan Hannah a stunning couture silhouette in beautiful guipure lace with fitted sheer sleeves and a beautiful buttoned back. It is a gorgeous shade of Ivory and the lace is very intricate and delicate. The dress has a high neck and is a very flattering shape on. It truly is something special and perfect for at timeless and elegant look. This dress is a UK12 but is better suited to a UK 10. This dress is brand new with tags of £2500 - due to our spring sample sale we are selling this dress for £695. At our bridal lounge we have redefined the wedding dress shopping experience by straying from the norm of traditional bridal retail. All of our dresses are available to try on at our boutique in Devon or are available to purchase online without visiting our boutique. We have two bridal consultants that are available to book an appointment with or communicate by direct messaging. You can chat to us to see if the dress you love will fit your measurements and we can take the time out to ensure its the perfect fit. Or if you wish please contact us to arrange a viewing of all of our dresses. We ship worldwide so please do get in touch to see if we can assist. We handpick all of our wedding gowns - so all of our gowns are part of an individual collection. 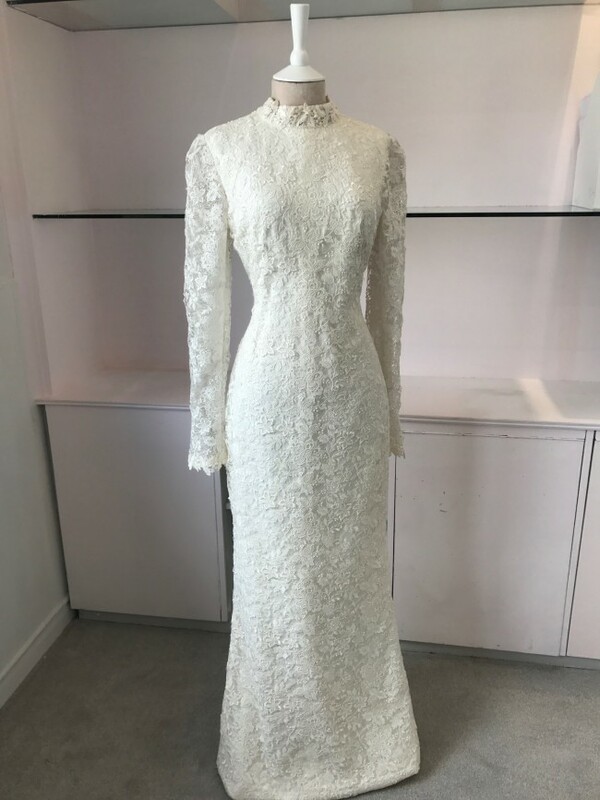 And because we know its important to browse online while dress shopping, you can view our wedding dress collection online. We have a diverse collection so it is a haven for stylish, classic and modern brides. Please contact us if you would like more information on dress styles and we would love to hear from you and we can find something suited to you.